70 years Futaba stand for quality and experience! On the occasion of this anniversary, the T18SZ is available as a refined Limited Edition. The case features the satin-matt platinum look and the refined metal control stick units offer innovative adjustment features. The sturdy transmitter case in the 70th Anniversary design provides the perfect protection for the transport of the Limited Edition transmitter. The T18SZ is a fully equipped 18-channel transmitter that leaves nothing to be desired in terms of transmission reliability, quality, function and usability. The well-known modulations such as FASST, FASSTest and FHSS were supplemented by the T-FHSS transmission technology so that telemetry operation in FHSS mode is now also possible. The menu navigation is clearly structured and can be quickly operated via the large color touch screen. 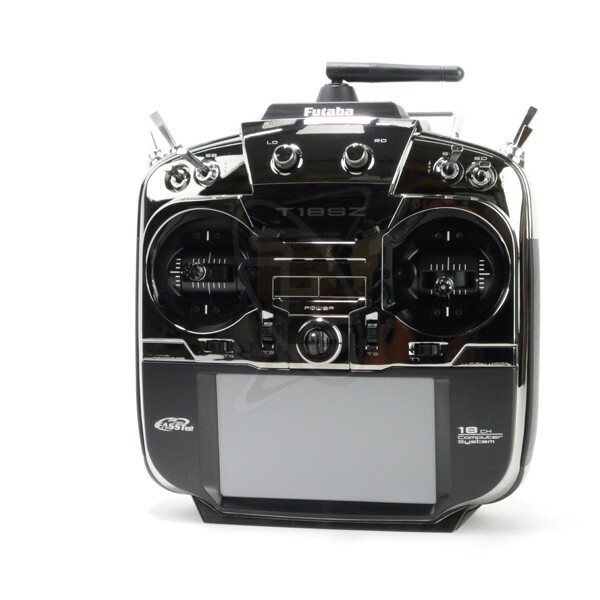 In addition to the familiar functions of the T-18MZ, a multicopter menu and 9-language menu navigation has been added. The integrated SD card slot for storing model data and software updates for future, new applications makes this remote control future-proof. The built-in speaker, as well as the LiFe rechargeable battery incl. Charger complete the package. The high-quality transmitter housing captivates by its processing quality and lies thereby perfectly in the hand. The ergonomically arranged switches and encoders allow fatigue-free operation and their precision is unique in this price segment.